1993　Graduated from the Western Art Course of Kyoto City Doda High School for Arts and Crafts. 1997　Graduated from Department of Oil Painting at Kyoto University of Art and Design. 2000　Worked as assistant for photographer Tomatsu Shomei in Nagasaki. 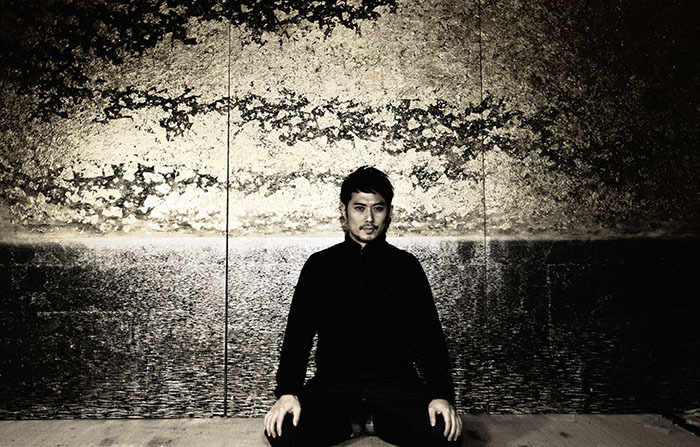 2001　Returned to his birthplace in the Nishijin district of Kyoto and begun his career as hakuga artist. 2002　Won Grand Prize at Amuse Artist Audition in Kyoto（The Museum of Kyoto／Kyoto）. AMUSE SELECTION Exhibition （Yurakucho Asahi Gallery／Tokyo）. 2004　First Solo Exhibition: Noguchi Takuro Hakuga Exhibition （BRICOLAGE／Osaka）. 2005　Noguchi Takuro Hakuga Exhibition　（Kyoto Nagomi or Wa Gallery／Kyoto）. 2006　Noguchi Takuro Hakuga Exhibition　（Daimaru Kyoto Art Spot／Kyoto）. 2007　Kyoto Art for Tomorrow　（The Museum of Kyoto／Kyoto）. Noguchi Takuro Hakuga Exhibition　（Ishida Taiseisha ICB／Kyoto）. Noguchi Takuro Hakuga Exhibition　（Daimaru Kyoto Art Spot／Kyoto）. 2008　Opened permanent collection at Gold leaf Art HAKUYA NOGUCHI （Kyoto）. Noguchi Takuro Hakuga Exhibition　（Daimaru Tokyo Art Gallery／Tokyo）. 2009　Noguchi Takuro Hakuga Exhibition （Daimaru Kyoto Art Salon／Kyoto）. 2010　Next Generation of Kyoto Artists　（The Museum of Kyoto／Kyoto）. Hakuga ＋ Noguchi Takuro Exhibition　（Gallery Hillgate／Kyoto）. 2011　Hakuga Noguchi Yasushi and Takuro Exhibition　（Porta gallery HANA／Kyoto）. Participated in Kyoto Aperto Open Studio （Hakuya Noguchi）. 三素三輝−Takeuchi Gentaro, Tajima Syugo, and Noguchi Takuro Exhibition　（Gallery NEXT Osaka Takashimaya／Osaka）. 2012　UTAGE　（The Westin Miyako Kyoto Aoi-Den／Kyoto）. GOLD EXPERIENCE 2 -Homage to the Golden Tigerfish- Exhibition（Aichi University of the Arts Satellite Gallery Jokaiso／Aichi）. ART KYOTO 2012　（Hotel Monterey Kyoto／Kyoto）　Exhibited with Gallery Nii. “You bring art back home. A new, fun, warm life begins.” Exhibition　（Ginza Mitsukoshi 8th Floor Gallery／Tokyo）. Nii Fine Arts Anniversary Exhibition（Nii Fine Arts／Osaka）. The 11th Korea International Art Fair 2012：KIAF2012　（COEX／Seoul, Korea）Exhibited with Gallery Toki-no-Wasuremono. Noguchi Takuro Exhibition　（Gallery Toki-no-Wasuremono／Tokyo）. ULTRA 005　（Spiral Garden／Tokyo）　Exhibited with Gallery Toki-no-Wasuremono. 2013　World of Prayer Exhibition（Kyoto Prefectural Center for Arts and Culture／Kyoto）. Craftsman and Samurai（Hankyu Umeda Main Store 9th Floor Art Stage／Osaka）. Hakuga Noguchi Yasushi and Takuro Exhibition　（Porta gallery HANA／Kyoto）. ART OSAKA 2013　（Hotel Granvia Osaka／Osaka）　Exhibited with Gallery Toki-no-Wasuremono. Hakuga Noguchi Takuro Exhibition −Towards Light−　（Shoko Kanazawa Art Museum／Fukushima). The 12th Korea International Art Fair 2013：KIAF2013　（Seoul, Korea）　Exhibited with Gallery Toki-no-Wasuremono. Hakuga Noguchi Takuro Exhibition　（Nii Fine Arts／Osaka）. 2014　GOODBYE TRADITIONS　（MICHEKO GALERIE／Munich, Germany）. ART OSAKA 2014　（Hotel Granvia Osaka／Osaka）　Exhibited with Nii Fine Arts. The 13th Korea International Art Fair 2014：KIAF2014　（COEX／Seoul, Korea）　Exhibited with Gallery Toki-no-Wasuremono. SINGAPORE ART FAIR　（Suntec Singapore Convention & Exhibition Center／Singapore）　Exhibited with Gallery Toki-no-Wasuremono. 2015 ART FAIR TOKYO 2015　（Tokyo International Forum／Tokyo）Exhibited with Gallery Toki-no-Wasuremono. TOBI WAVE Exhibition　（Tokyo Art Club／Tokyo）. ART OSAKA 2015　（Hotel Granvia Osaka／Osaka）　Exhibited with Nii Fine Arts. ART SANTA FE 2015　（Santa Fe Convention Center／Santa Fe, America）　Exhibited with Gallery Toki-no-Wasuremono. The 14th Korea International Art Fair 2015：KIAF2015　（COEX／Seoul, Korea）　Exhibited with Gallery Toki-no-Wasuremono. 2016　Hakuga Noguchi Takuro Exhibition　（Nii Fine Arts／Osaka）. ART BUSAN 2016　（BEXCO／Busan, Korea）　Exhibited with Gallery Toki-no-Wasuremono. ART OSAKA 2016　（Hotel Granvia Osaka／Osaka）　Exhibited with Nii Fine Arts. ART STAGE JAKARTA 2016　（Sheraton Grand Jakarta Gandaria City Hotel／Jakarta, Indonasia）　Exhibited with Gallery Toki-no-Wasuremono. ART FAIR ASIA FUKUOKA 2016　（Hotel Okura Fukuoka／Fukuoka） Exhibited with Nii Fine Arts. The 15th Korea International Art Fair 2016：KIAF2016 / ART SEOUL　（COEX／Seoul, Korea）　Exhibited with Gallery Toki-no-Wasuremono. ART TAIPEI 2016　（Taipei World Trade Center／Taipei, Taiwan）　Exhibited with Gallery Toki-no-Wasuremono. 2017　ART STAGE SINGAPORE 2017　（Marina Bay Sands／Singapore）　Exhibited with Gallery Toki-no-Wasuremono. art on paper 2017　（Pier 36／NYC, Tokyo）　Exhibited with Gallery Toki-no-Wasuremono. ART OSAKA 2017　（Hotel Granvia Osaka／Osaka）　Exhibited with Nii Fine Arts. Hakuga Noguchi Takuro Exhibition　（Daimaru Kyoto Art Gallery／Kyoto）. ART MIAMI 2017　（One Miami Herald Plaza／Miami, America） Exhibited with Gallery Toki-no-Wasuremono. 2018　ART NAGOYA 2018　（Hotel Nagoya Castle／Nagoya）　Exhibited with Nii Fine Arts. art on paper 2018　（Pier 36／NYC, America） Exhibited with Gallery Toki-no-Wasuremono.